Studebaker Corporation, or simply Studebaker (/ˈstuːdəbeɪkər/, STOO-də-bay-kər), was a United States wagon and automobile manufacturer based in South Bend, Indiana. Founded in 1852 and incorporated in 1868 under the name of the Studebaker Brothers Manufacturing Company, the company was originally a producer of wagons for farmers, miners, and the military. 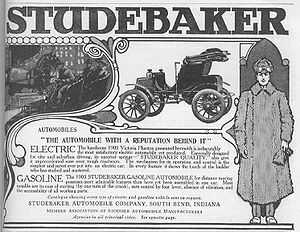 Studebaker entered the automotive business in 1902 with electric vehicles and in 1904 with gasoline vehicles, all sold under the name "Studebaker Automobile Company". Until 1911, its automotive division operated in partnership with the E-M-F Company and the Garford Company of Elyria, Ohio. 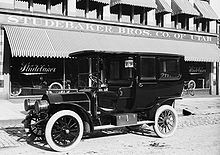 The first gasoline cars to be fully manufactured by Studebaker were marketed in August 1912.:p231 Over the next 50 years, the company established an enviable reputation for quality and reliability. The South Bend plant ceased production on December 20, 1963, and the last Studebaker car rolled off the Hamilton, Ontario, Canada, plant on March 16, 1966. The five Studebaker brothers—founders of the Studebaker Corporation. 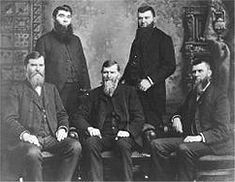 Left to right, (standing) Peter and Jacob; (seated) Clem, Henry, and John M.
The five sons were, in order of birth: Henry (1826–1895), Clement (1831–1901), John Mohler (1833–1917), Peter Everst (1836–1897) and Jacob Franklin (1844–1887). The boys had five sisters. Photographs of the brothers and their parents are reproduced in the 1918 company history, which was written by Erskine after he became president, in memory of John M.:p.5 whose portrait appears on the front cover. Directors Frederick Samuel Fish and Henry Goldman are also pictured in the book. Clement and Henry Studebaker, Jr., became blacksmiths and foundrymen in South Bend, Indiana, in February 1852.:p229 They first made metal parts for freight wagons and later expanded into the manufacture of complete wagons. At this time, John M was making wheelbarrows in Placerville, California. The site of his business is California Historic Landmark #142. That was when John M bought out Henry's share of the business. Henry was deeply religious and had qualms about building military equipment. The Studebakers were Dunkards, a religion that viewed war as evil. Longstreet's official company history simply says "Henry was tired of the business. He wanted to farm. The risks of expanding were not for him". :p.26 Expansion continued from manufacture of wagons for westward migration as well as for farming and general transportation. During the height of westward migration and wagon train pioneering, half of the wagons used were Studebakers. They made about a quarter of them, and manufactured the metal fittings for other builders in Missouri for another quarter-century. The fourth brother, Peter E, was running a successful general store at Goshen which was expanded in 1860 to include a wagon distribution outlet. :p.28 A major leap forward came from supplying wagons for the Union Army in the Civil War (1861–65). By 1868, annual sales had reached $350,000. :p229 That year, the three older brothers formed the Studebaker Brothers Manufacturing Company—Clem (president), Peter (secretary), and John M (treasurer). :p.38 By this time the factory had a spur line to the Lake Shore railroad and, with the Union Pacific Railroad finished, most wagons were now dispatched by rail and steamship. In 1875, the youngest brother, 30-year-old Jacob, was brought into the company to take charge of the carriage factory, making sulkies and five-glass landaus. Following a great fire in 1874 which destroyed two-thirds of the entire works, they had rebuilt in solid brick, covering 20 acres (81,000 m2) and were now "The largest vehicle house in the world". 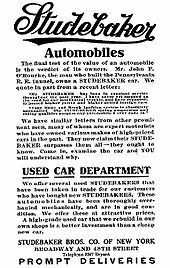 :p.43 The best people were buying Studebaker sulkies, broughams, clarences, phaetons, runabouts, victorias, and tandems. The wealthiest could buy for $20,000 a four-in-hand smart enough to carry a dozen swells in style, with red wheels, gold-plated lamps, yellow trim; and the driver cracked a 15 ft (4.6 m) braided whip over the fashionably cropped tails of four or even six matched horses. In 1889, incoming President Harrison ordered a full set of Studebaker carriages and harnesses for the White House. As the twentieth century approached, the South Bend plant "covered nearly 100 acres (0.40 km2) with 20 big boilers, 16 dynamos, 16 large stationary engines, 1000 pulleys, 600 wood- and iron-working machines, 7 miles (11 km) of belting, dozens of steam pumps, and 500 arc and incandescent lamps making white light over all". :p.54 The worldwide economic depression of 1893 caused a dramatic pause in sales and the plant closed down for five weeks, but industrial relations were good and the organised workforce declared faith in their employer. The five brothers died between 1887 and 1917 (when John Mohler was the last to go). Their sons and sons-in-law remained active in the management, most notably, lawyer Fred Fish Sr after his marriage to John M's daughter Grace in 1891. "Col. George M Studebaker, Clement Studebaker Jr, J M Studebaker Jr, and [Fred Sr's son] Frederick Studebaker Fish served apprenticeships in different departments and rose to important official positions, with membership on the board. ":p41 Erskine adds sons-in-law Nelson J Riley, Charles A Carlisle, H D Johnson, and William R Innis. 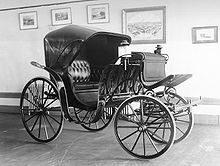 In 1895, John M Studebaker's son-in-law Fred Fish urged for development of 'a practical horseless carriage'. When, on Peter Studebaker's death, Fish became chairman of the executive committee in 1897, the firm had an engineer working on a motor vehicle. :p.66 At first, Studebaker opted for electric (battery-powered) over gasoline propulsion. (See main article Studebaker Electric (automobile).) While it attempted to manufacture its own electric vehicles from 1902 to 1911, the company entered into body-manufacturing and distribution agreements with two makers of gasoline powered vehicles, Garford of Elyria, Ohio, and the Everett-Metzger-Flanders (E-M-F) Company of Detroit and Walkerville, Ontario). Beginning in 1904, Studebaker began making gasoline-engined cars. Studebaker's marketing agreement with the E-M-F Company was a different relationship, one John Studebaker had hoped would give Studebaker a quality product without the entanglements found in the Garford relationship, but this was not to be. Under the terms of the agreement, E-M-F would manufacture vehicles and Studebaker would distribute them through its wagon dealers. Studebaker's Big Six Touring Car, from a 1920 magazine ad. John M Studebaker had always viewed the automobile as complementary to the horse-drawn wagon, pointing out that the expense of maintaining a car might be beyond the resources of a small farmer. 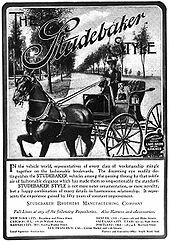 As a result, the manufacture of horse-drawn vehicles was not wholly ceased until Erskine ordered removal of the last wagon gear in 1919.:p.90 To the cars, Studebaker added a truck line, which later replaced the horse-drawn wagons. Buses, fire engines, and even small rail locomotives were produced using the same powerful six-cylinder engines. In 1925, the corporation's most successful distributor and dealer Paul G. Hoffman came to South Bend as vice-president in charge of sales. In 1926, Studebaker became the first automobile manufacturer in the United States to open a controlled outdoor proving ground on which, in 1937, would be planted 5,000 pine trees in a pattern that spelled "STUDEBAKER" when viewed from the air. Also in 1926, the last of the Detroit plant was moved to South Bend under the control of Harold S Vance, vice-president in charge of production and engineering. That year, a new small car, the Erskine Six was launched in Paris, resulting in 26,000 sales abroad and many more in America. :p.91 By 1929, the sales list had been expanded to 50 models and business was so good that 90 per cent of earnings were being paid out as dividends to shareholders in a highly competitive environment. However, the end of that year ushered in the Great Depression which saw many layoffs and massive national unemployment for several years. Plant 7 was at Walkerville, Canada, where complete cars were assembled from South Bend, Detroit, and locally-made components for the Canadian and British Empire (right-hand-drive) trade. By siting it there, Studebaker could advertise the cars as "British-built" and qualify for reduced tariffs. :p237 This manufacturing facility had been acquired from E-M-F in 1910 (see above). By 1929, it had been the subject of $1.25 million investment and was providing employment which supported 500 families. 1953 Studebaker Commander Starliner, showing the streamlined design of the 1950s Studebaker. Studebaker prepared well in advance for the anticipated post-war market and launched the slogan First by far with a post-war car. This was substantiated by Virgil Exner's designs, notably the 1947 Studebaker Starlight coupé, which introduced innovative styling features that influenced later cars, including the flatback "trunk" instead of the tapered look of the time, and a wrap-around rear window. Exner's concepts were spread through a line of models like the 1950 Studebaker Champion Starlight coupe  The new trunk design prompted a running joke that one could not tell if the car was coming or going. Ballooning labor costs (the company had never had an official United Auto Workers (UAW) strike and Studebaker workers and retirees were among the highest paid in the industry), quality control issues, and the new car sales war between Ford and General Motors in the early 1950s wreaked havoc on Studebaker's balance sheet. :p254-255 Professional financial managers stressed short-term earnings rather than long-term vision. There was enough momentum to keep going for another ten years, but stiff competition and price-cutting by the Big Three doomed the enterprise. There was also a labor strike at the South Bend plant in 1962. See also Studebaker Canada Ltd.
A three-year management contract was made by Nance with aircraft maker Curtiss-Wright with the aim of improving finances. C-W's president, Roy T. Hurley, attempted to cure Studebaker's ruinously lax employment policies. Under C-W's guidance, S-P also sold the old Detroit Packard plant and returned the then-new Packard plant to its lessor, Chrysler. 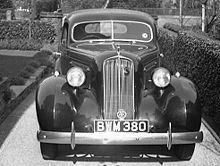 The company became the American importer for Mercedes-Benz, Auto Union, and DKW automobiles and many Studebaker dealers sold those brands as well. C-W gained the use of idle car plants and tax relief on their aircraft profits while Studebaker received further working capital to continue car production. The automobiles that came after the diversification process began, including the ingeniously-designed compact Lark (1959) and the Avanti sports car (1963), were based on old chassis and engine designs. The Lark, in particular, was based on existing parts to the degree that it even utilized the central body section of the company's 1953–58 cars, but was a clever enough design to be quite popular in its first year, selling over 130,000 units and delivering an unexpected $28.6 million profit to the automaker. Despite a sales uptick in 1962, continuing media reports that Studebaker was about to leave the auto business became a self-fulfilling prophecy as buyers shied away from the company's products for fear of being stuck with an "orphan". By 1963, all of the company's automobiles and trucks were selling very poorly. Limited automotive production was consolidated at the company's last remaining production facility in Hamilton, Ontario, Canada, which had always been profitable and where Studebaker produced cars until March 1966 under the leadership of Gordon Grundy. It was projected that the Canadian operation could break even on production of about 20,000 cars a year, and Studebaker's announced goal was 30,000–40,000 1965 models. While 1965 production was just shy of the 20,000 figure, the company's directors felt that the small profits were not enough to justify continued investment. Rejecting Grundy's request for funds to tool up for 1967 models, Studebaker left the automobile business on 16 March 1966 after an announcement on 4 March. A turquoise and white Cruiser sedan was the last of fewer than 9,000 1966 models manufactured. In reality, the move to Canada had been a tactic by which production could be slowly wound down and remaining dealer franchise obligations honored. Many of Studebaker's dealers either closed, took on other automakers' product lines, or converted to Mercedes-Benz dealerships following the closure of the Canadian plant. Studebaker's General Products Division, which built vehicles to fulfill defense contracts, was acquired by Kaiser Industries, which built military and postal vehicles in South Bend. In 1970, American Motors purchased the division, which still exists today as AM General. By the early 1960s, Studebaker had begun to diversify away from automobiles. Numerous companies were purchased, bringing Studebaker into such diverse fields as the manufacture of tire studs and missile components. Franklin – Appliance Division, Minneapolis, Minnesota (home office; other locations also in Minnesota, Iowa, and Ontario). Manufactured private label kitchen and laundry appliances for major retailers until sold to White Consolidated Industries. STP – Scientifically Treated Products Division, Des Plaines, Illinois, and Santa Monica, California. Produced automotive engine additives. SASCO – Studebaker Automotive Sales Corp., South Bend, Indiana, Closed and liquidated 2009. Having built the Wright R-1820 under license during World War II, Studebaker also attempted to build what would perhaps have been the largest aircraft piston engine ever built. With 24 cylinders in an "H" configuration, a bore of 8 in (203 mm) and stroke of 7.75 in (197 mm), displacement would have been 9,349 cubic inches (153.20 L), ergo the H-9350 designation. It was not completed. The remains of the auto maker still exist as Studebaker-Worthington Leasing, a subsidiary of Main Street Bank – Kingwood Texas, which provides leasing services for manufacturers and resellers of business and industrial products. 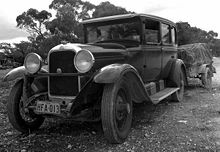 ^ "German heritage biography: Studebaker Brothers". http://www.germanheritage.com/biographies/mtoz/studebaker.html. Retrieved 2007-02-06. ^ a b c d e f g h i j k l m n o p q r Hendry, Maurice M. Studebaker: One can do a lot of remembering in South Bend. New Albany: Automobile Quarterly. pp. 228–275. Vol X, 3rd Q, 1972. ^ a b c d e f g h i j k l m n o Longstreet, Stephen. A Century on Wheels: The Story of Studebaker. New York: Henry Holt and Company. pp. 121. 1st edn., 1952. ^ Conway's of Ireland —Clement Studebaker (1758–1840). See also alternate family-tree information for Descendants of John Clement Studebaker & Rebecca Mohler and Studebaker Family Tree Errata. ^ a b c The Hamilton Spectator–Souvenir Edition page MP45 (June 10, 2006). "The Hamilton Memory Project; STUDEBAKER". Press release. ^ Johnson, Dale (2006-03-04). "(Copy of)The last days of Studebaker". The Toronto Star. http://clubs.hemmings.com/clubsites/hpsdc/LastDays.htm. Retrieved 2007-02-06. This page was last modified on 26 October 2010 at 04:58.